Friday’s are always fun. Today, I took the dog for a long walk, went to Zumba, and met some friends for an impromptu lunch. 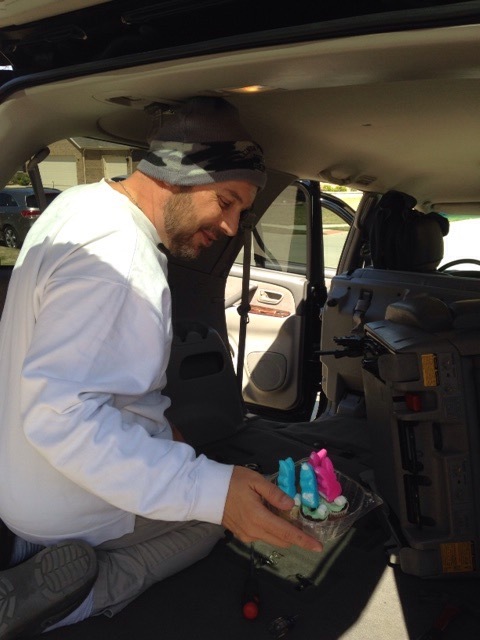 The neat part is, I thought I was meeting just one friend, but she texted a couple other girls, and they were free, so they surprised me. Fun! 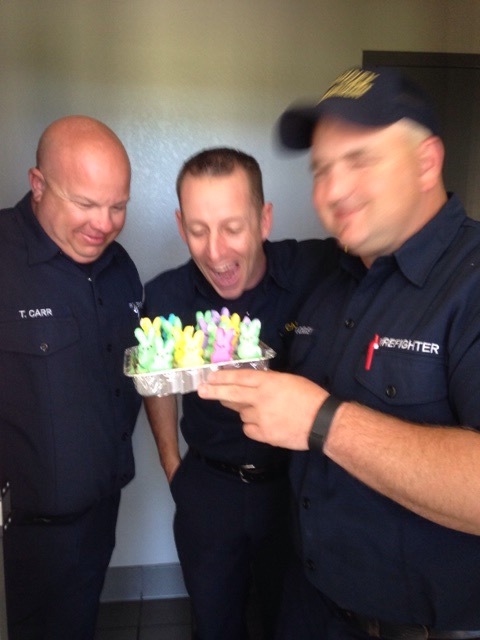 I had stopped at Fire Station 5 on the way to lunch, but they were all out on a call. 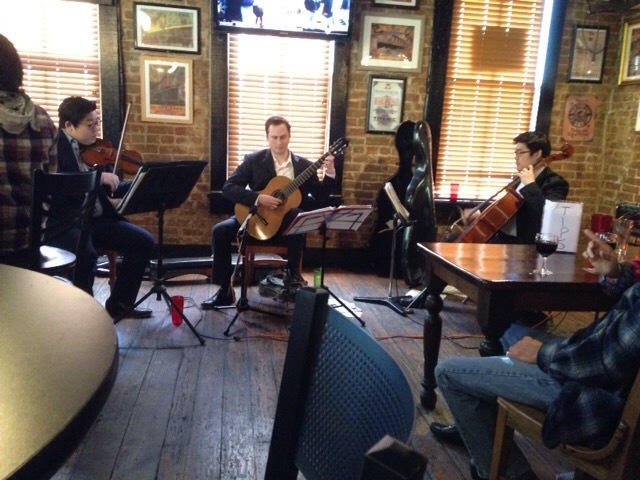 Fortunately, they were back after lunch. 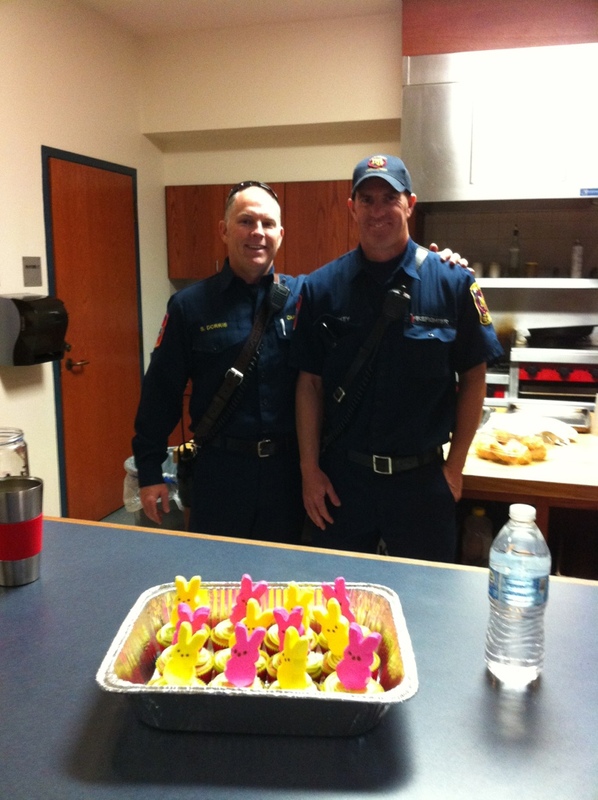 I was up to my usual crazy baking frenzy, so I thought I’d share my cupcakes and brownies with my local fire fighters. They always appreciate a visit from Miss Toni. 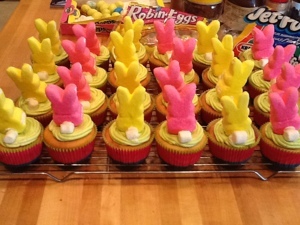 A few Peeps for my special peeps. When I got home, another long walk with Bella. 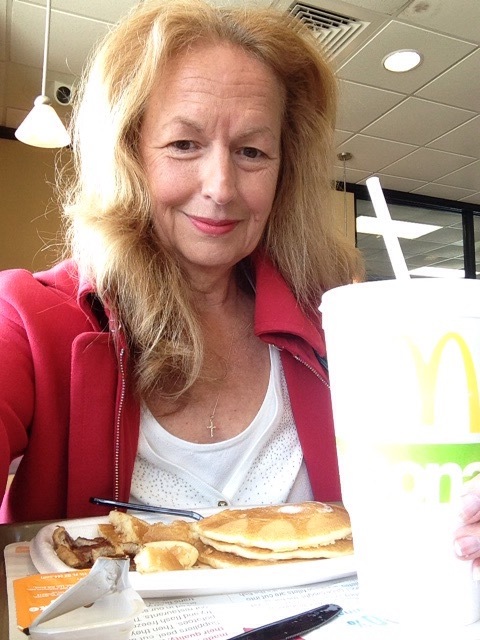 Then, I dropped her off back home, then walked a few blocks to Mr. Larry’s and Miss Sandy’s. 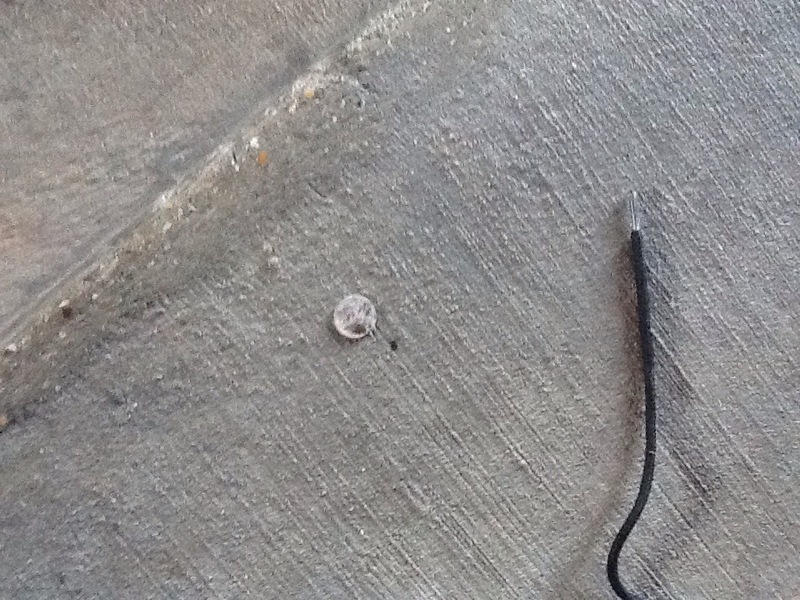 Yep, they were sitting in the garage. Time for a Blue Moon beer and some neighborhood gossip. 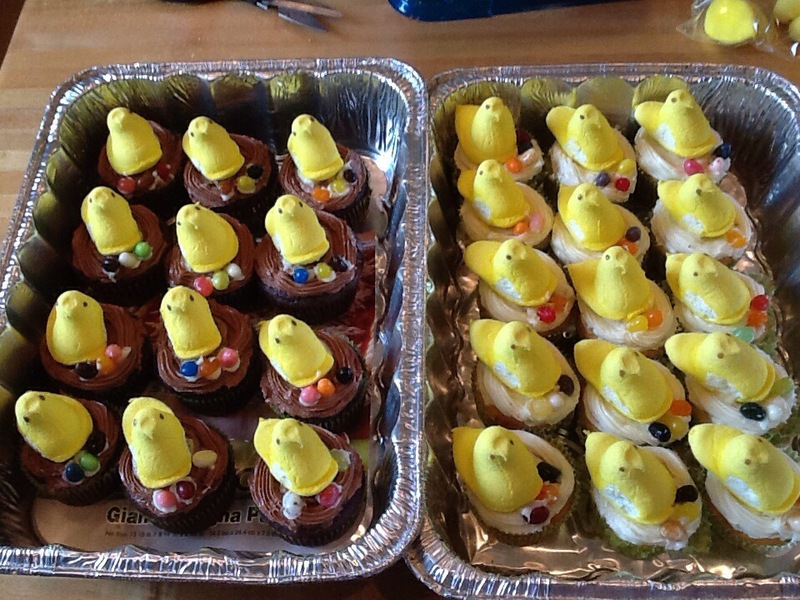 It was starting to get dark, so I scurried home, with just enough time to visit a couple more neighbors with my famous Peep cupcakes. Enough sharing for today. It’s Black Russian Friday. 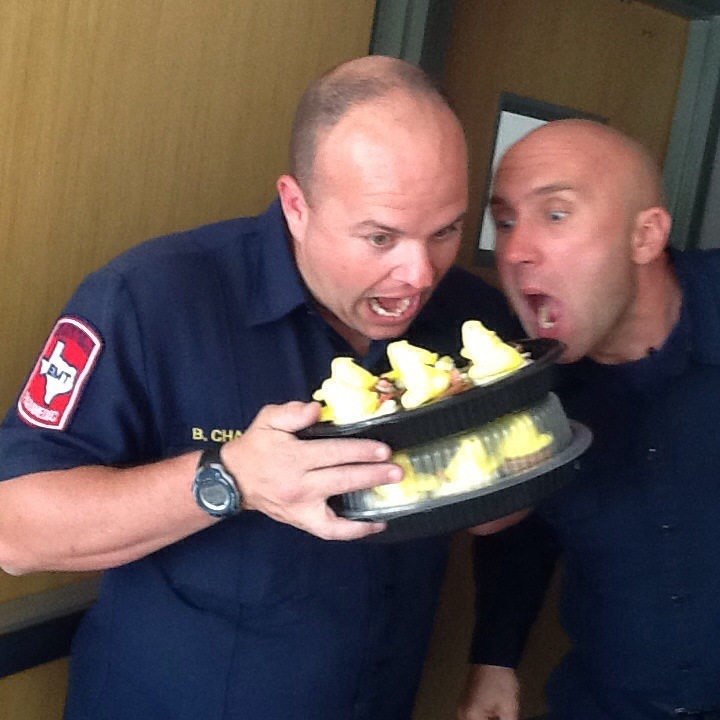 My “peeps” are the greatest. 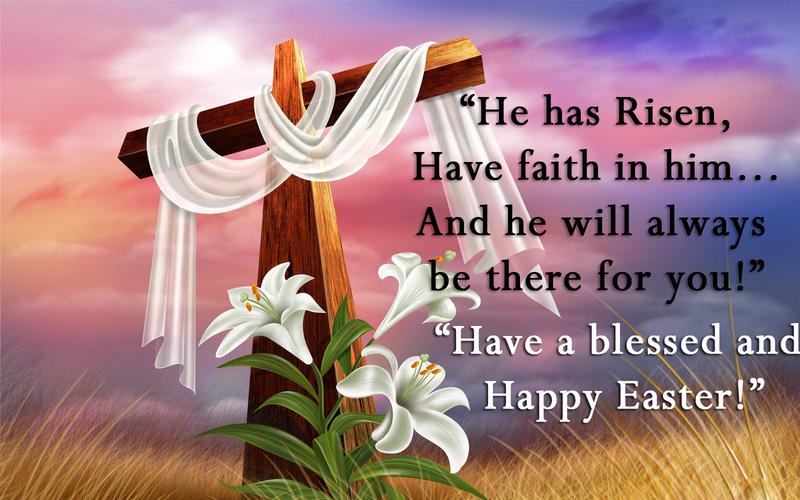 I usually call them my friends, but around Easter time, I call them my peeps. 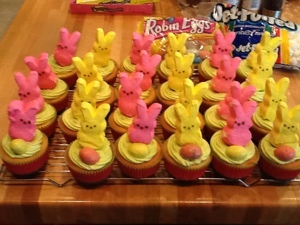 I bake up a storm during Easter weekend, making these cute bunny peep cupcakes and sharing them with neighbors and friends. I’ll let the pictures tell the story. 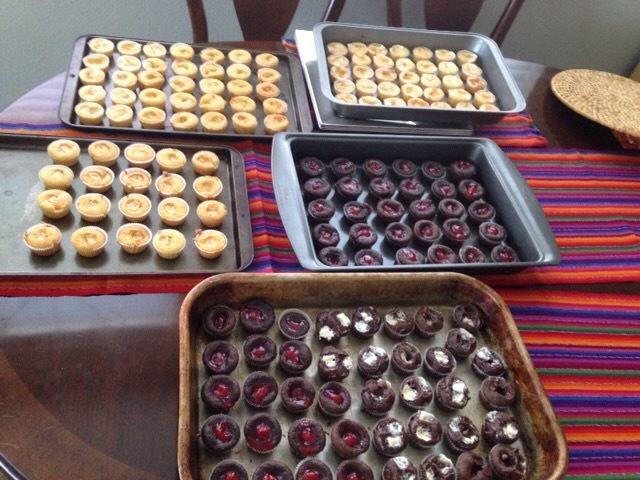 Step 1: Bake a zillion mini cupcakes. Some chocolate with a cherry, others with marshmallow and chocolate chips. The yellow cake mix cup cakes have a small piece of peach. 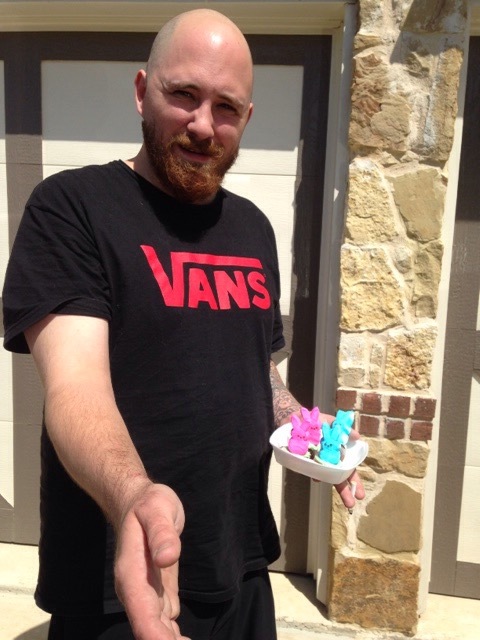 Step 3: Start delivering the peeps to your peeps. 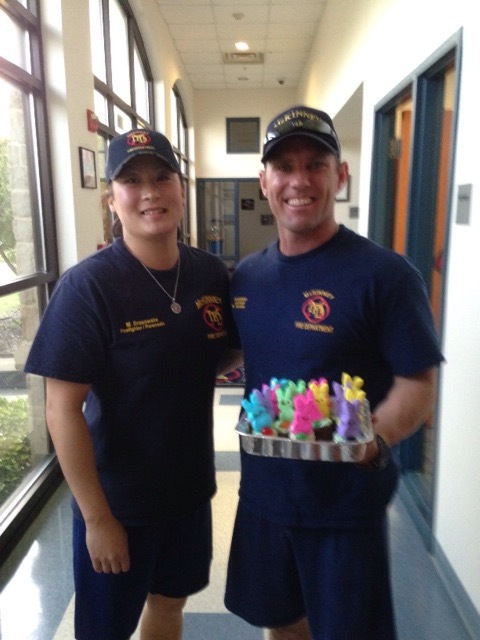 Fire Station 5 peeps. 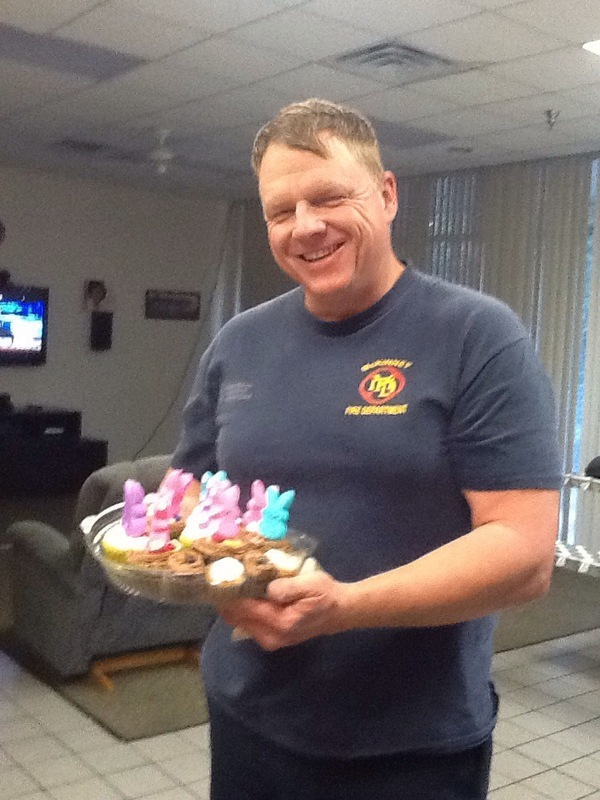 I always appreciate my local fire fighters. Station 2 went out on a call just as I was pulling in. I’ll have to catch them tomorrow. I still have the other 1/2 zillion cup cakes for tomorrow. 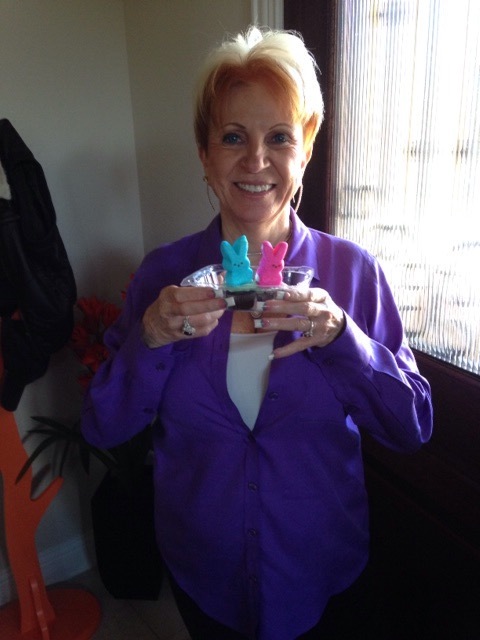 Hoppy Easter to all my PEEPS out there. Love you guys! 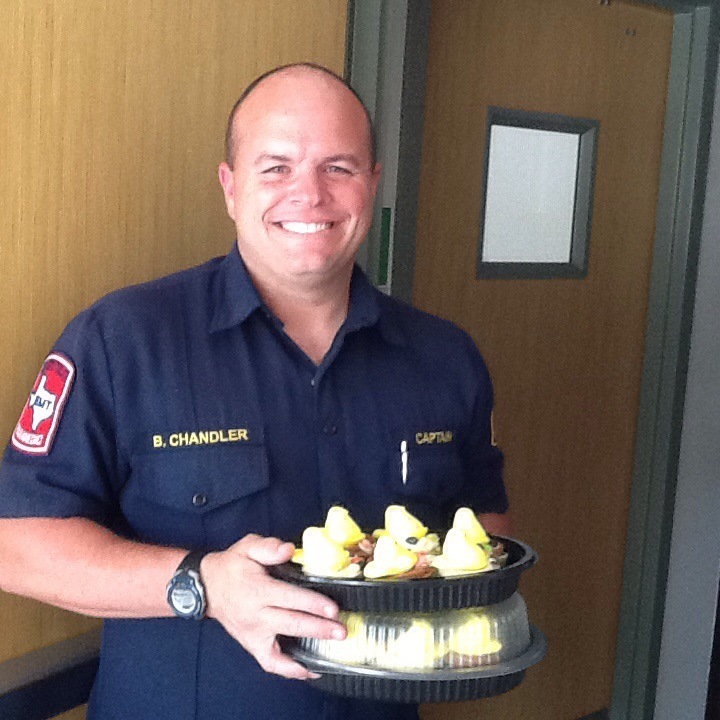 Then, all my peeps and I delivered a few more cupcakes to neighbors, friends and of course, the firemen. Then, off to Station #8. 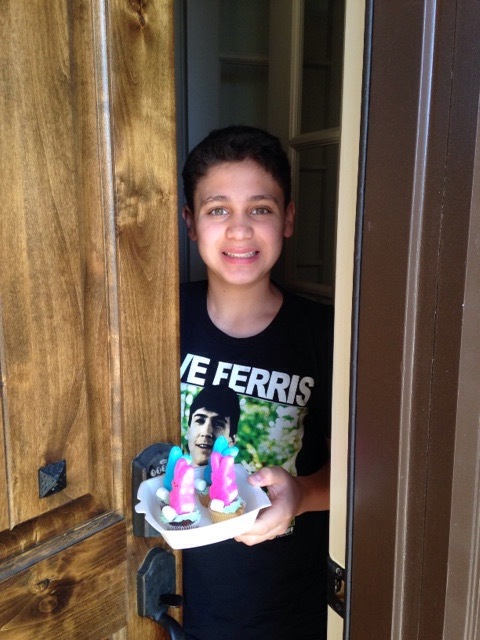 Captain Chandler came to the door with a big smile. He was joined by a hungry companion. 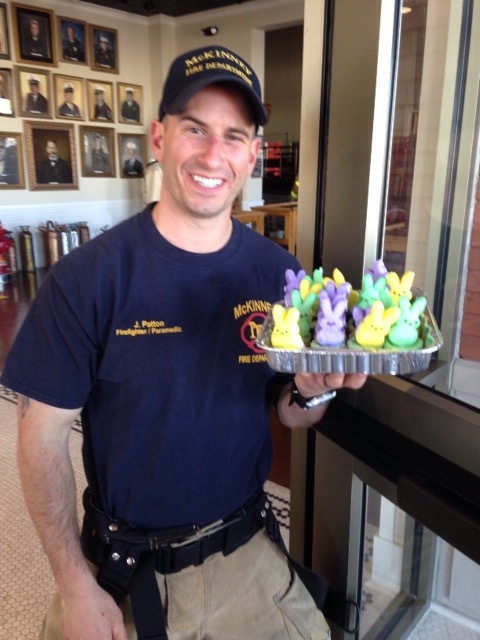 I did tell the firefighters that I ran out of bunnies, but seeing as they were “chick magnets,” that they could appreciate the humor. 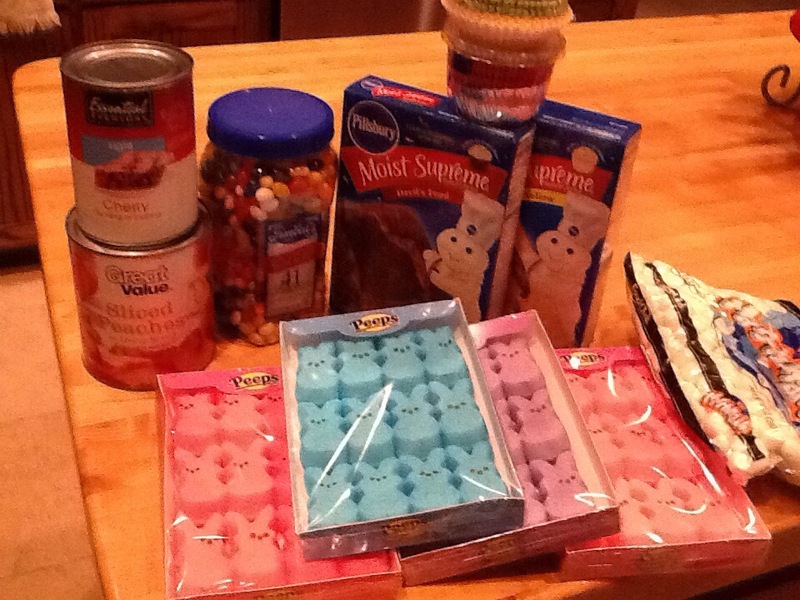 I had all the ingredients set out last night so I could get up early and start my baking frenzy. As I opened the fridge to take out the eggs, oh no, only two eggs. So, off to the store I went. 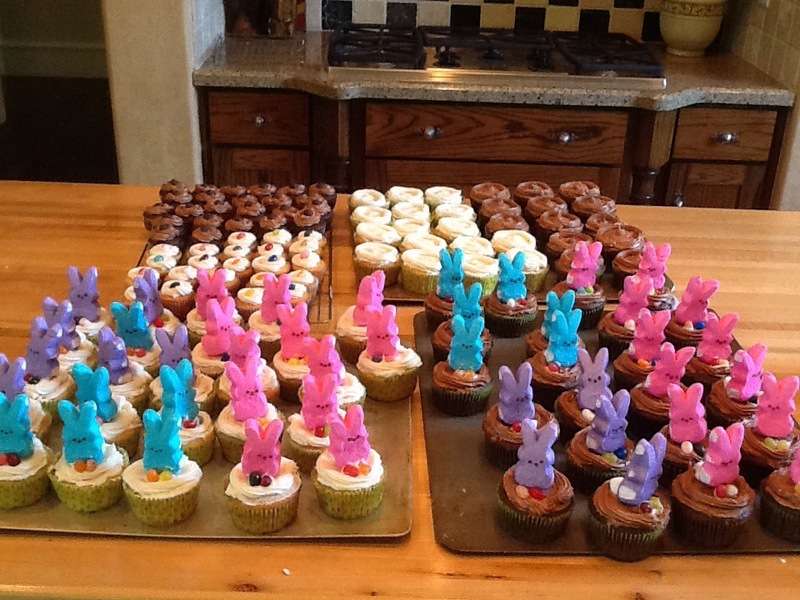 Foolish me, I thought I’d have time to make frosting, bake and decorate ten dozen cupcakes in the morning, take a long walk, and be out of the house by two. Ha! But, I did manage to post my progress hourly on my Facebook page. Here’s the progress. Set out ingredients, then go to the store for the eggs I forgot. 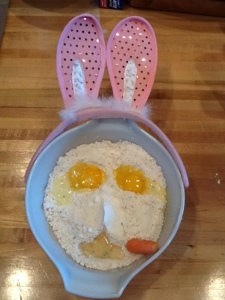 Make a funny face with the cake mix and eggs. 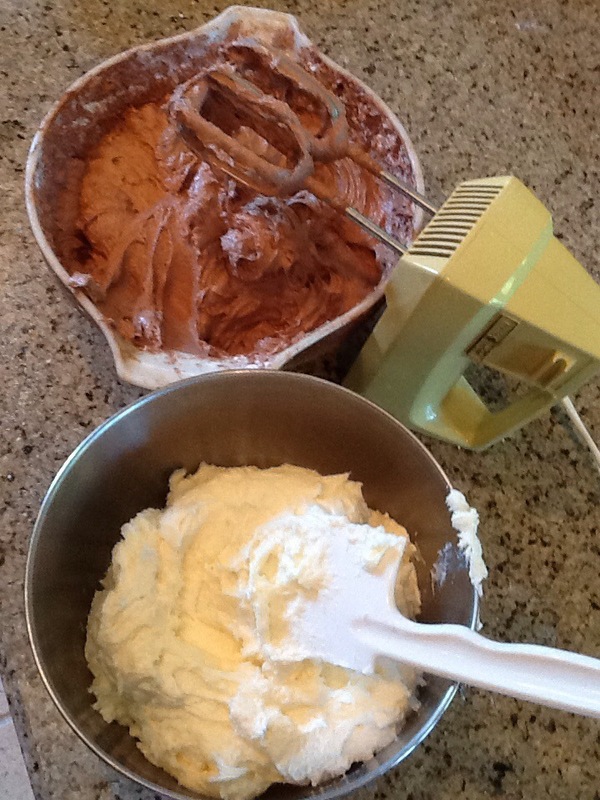 Make two batches of cream cheese frosting. Vanilla and chocolate. 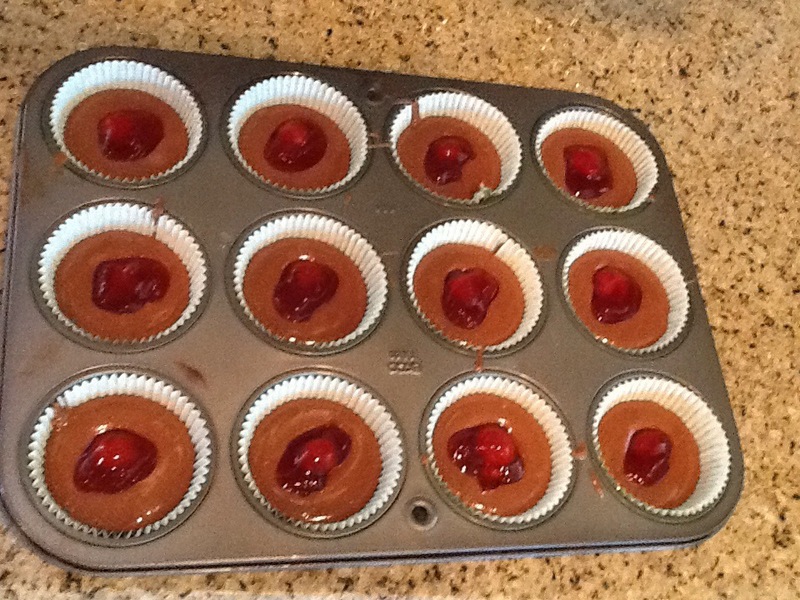 The chocolate cupcakes had a dollop of cherry pie filling, the yellow had a peach slice. 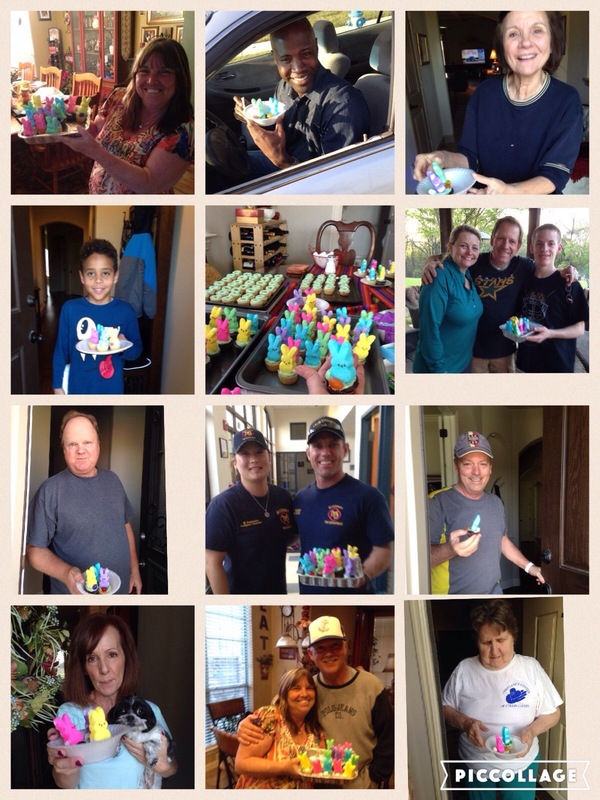 Frost and decorate a zillion cupcakes and mini cupcakes…then share with friends. 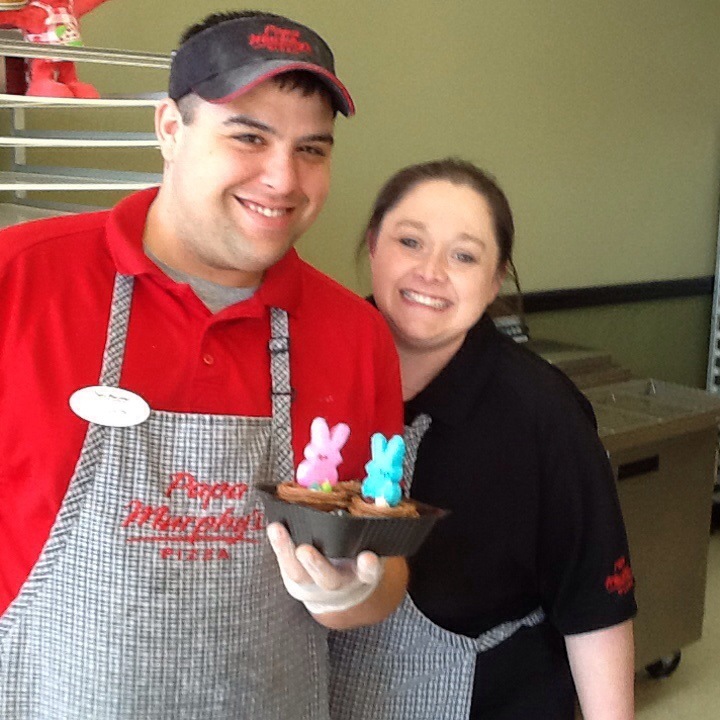 Justin and Karri…my good friends at Papa Murphy’s Pizza. Hi guys! Firefighter Taylor over at Station #1. He looks pretty pleased. 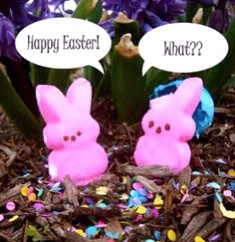 So, here’s to all my “PEEPS” out there. 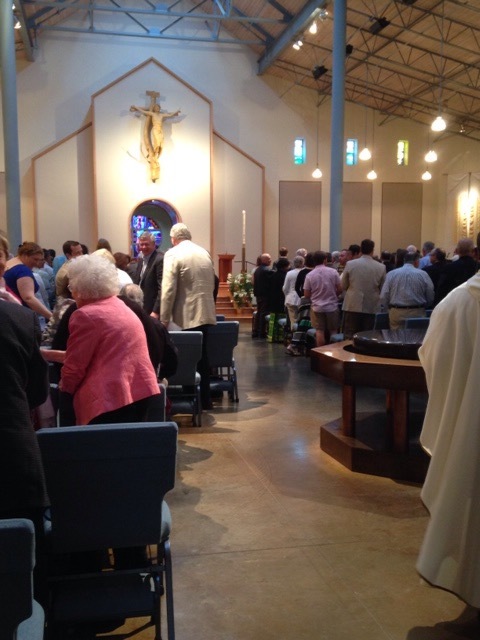 It was a good Good Friday. How was your day? I got up at the crack of dawn. Well, there really wasn’t a crack, as much as a full-fledged right smack in your face sunshine pouring in the windows morning. 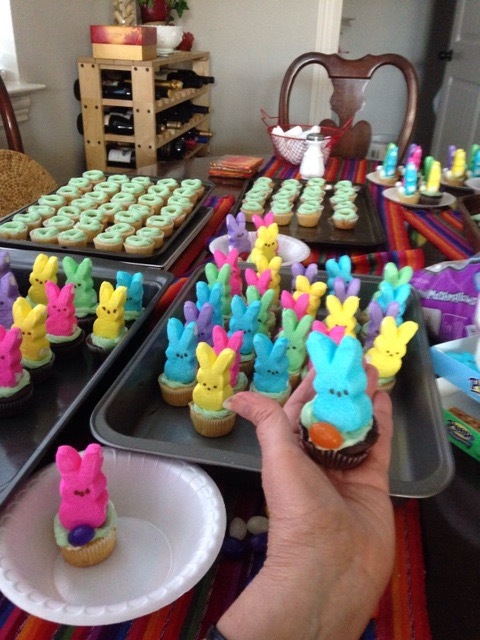 My plan for the day was to get up early and start baking a zillion cute cupcakes with the marshmallow Peep bunnies on top. Everybody loves them. It was a massive production. While the mixer was blazing with the first batch of yellow cake mix, the oven was reaching 350 degrees. I put paper cupcake liners in 2 pans of a dozen, and started pouring in batter, adding a teaspoon of cherry pie filling in the center. While the cupcakes were baking, I started mixing up the cream cheese frosting, adding a little green food coloring. Then another batch of chocolate cupcakes. 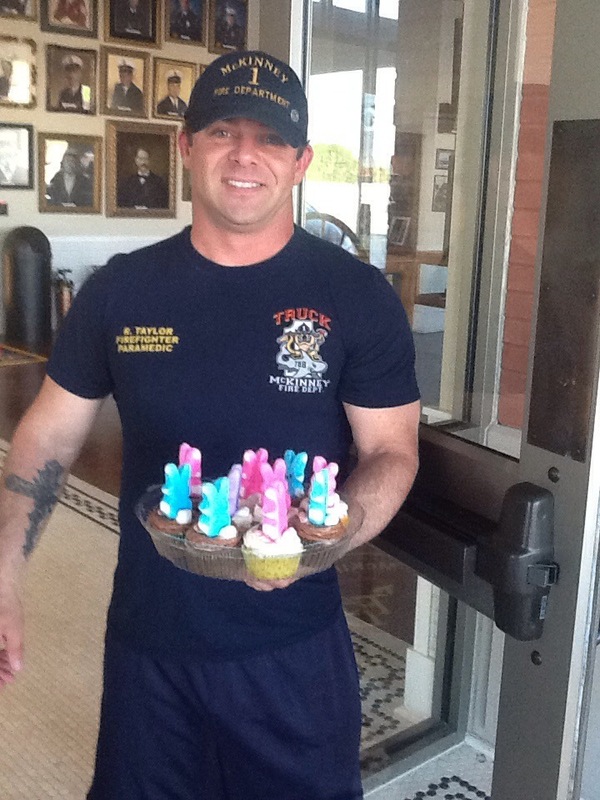 Several hours and 48 cupcakes later, I placed pink and yellow Peeps on top of each one, using a pretzel stick instead of a toothpick to secure the bunny. Then I put a dab of frosting on a mini marshmallow for a bunny tail. 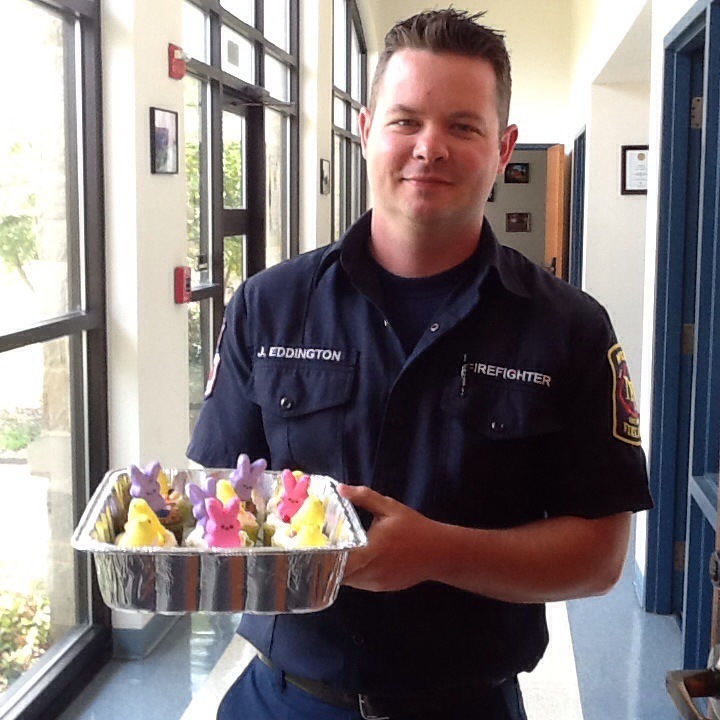 The first dozen went over to Fire Station 5. 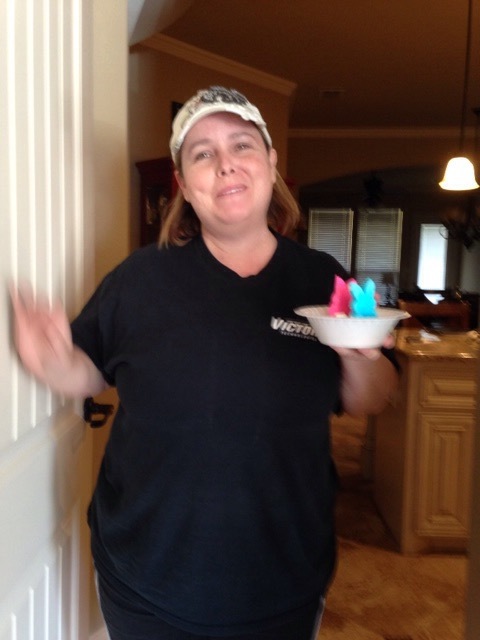 I took a couple over to Kerri and Justin at Papa Murphy’s when I picked up my pizza for dinner later. Six more went next door to the triplets and the family. Then, it was 2 pm and time for my senior art group. They enjoyed the special bunny treats. Who wouldn’t? Oh yes! 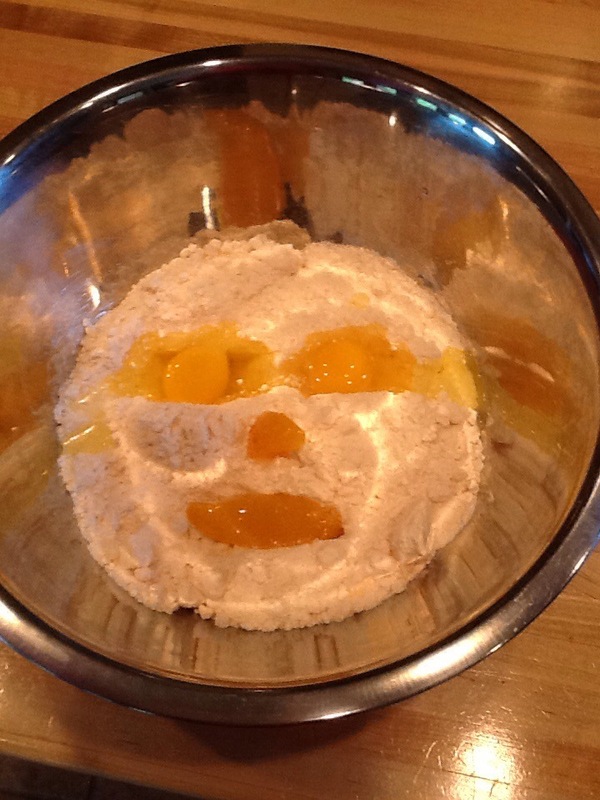 I always like to make a funny face with the mixes. What do you think?